[George du Maurier, Punch artist and cartoonist.] 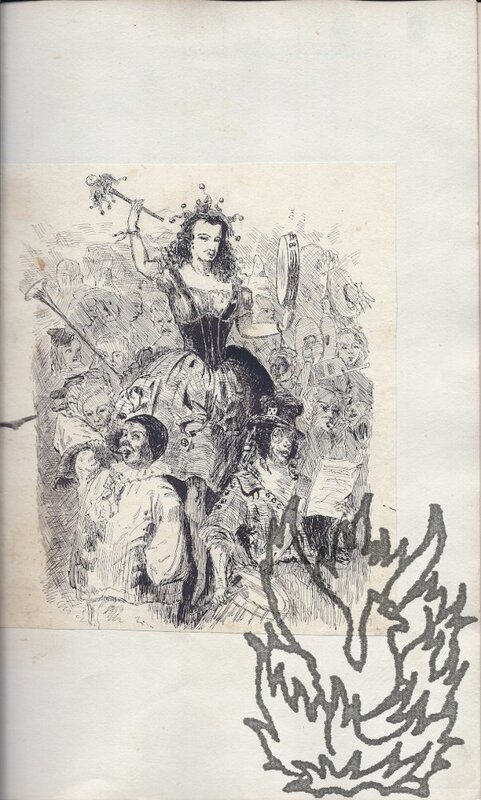 Autograph Signature ('Yours faithfully | George du Maurier') in response to a request for an autograph. On 5 x 10 cm slip of paper. In good condition, lightly aged. 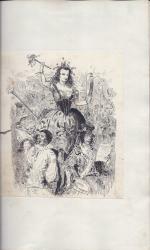 Reads: 'Yours faithfully | George du Maurier'. The first line lightly inked, the signature itself bold and strong. Nothing else on the card, except for the number '92' in a contemporary hand at top left above the signature. [ Sir Gerald du Maurier, actor-manage. ] Typed Letter Signed to composer Herman Finck, regarding his 'very delightful well-favoured' daughter. On letterhead of Wyndham's Theatre, London. 5 September 1921. 1p., 8vo. On aged and worn paper. Reads: 'One of the extraordinary things in this world is heredity. I occasionally met on the golf links at Thurlestone, a very delightful well-favoured young lady, of whom I saw too little. She told me she was your daughter. Is it possible? and such charming manners too. Well! its a wonderful world.' Finck's song 'In the Shadows' was one of the last to be played as RMS Titanic went down. [ Victor Jamaer, Belgian architect. ] Heavily-corrected draft manuscript proposal (by Jamaer?) to 'Monsieur le Bourgmestre', for adding statues of Albert and Isabelle to the facade of the Maison du Roi in the Grand Place. [ Belgium. ] Undated [ circa 1868? ]. 3pp., 8vo. Bifolium. In fair condition, on aged, worn and brittle paper. 66 lines of closely-written text, heavily revised with additions, deletions and emendations. 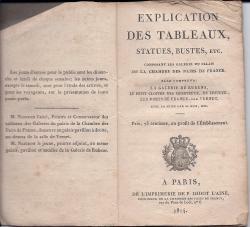 The author describes his scheme as 'un projet qui contribuerait a l'embellissement de le grand plan de Bruxelles, sans qu'il coutait rien a la ville'. He describes the renovation of the facade of the Maison du Roi, and suggests the placing of 'Statuettes d'Albert et d'Isabelle' in a 'niche gothique'. Jamaer reconstructed the Maison du Roi in 1868. [ Rev. Issac Williams, Oxford Movement cleric. ] Autograph Letter Signed ('Isaac Williams') to Rev. W. S. O. du Sautoy, regarding a memorial to Bishop Ken. No place. 11 September [circa 1845]. 1p., 12mo. In fair condition, on lightly-aged paper with a couple of short closed tears at fore-edge. He states that he will derive 'much satisfaction in being allowed to join in any undertaking to do honor to the Memory of Bishop Ken' [ Thomas Ken (1637-1711) ], and subscribes for three guineas. The memorial would appear to have been a stained-glass window in Ken's church at Frome by 'Mr. O'Connor and his son', as reported in the Gentleman's Magazine, February 1845 and February 1849. [George du Maurier's 'Trilby'.] The original version, as published in eight parts in Harper's New Monthly Magazine, containing the characterisation of 'Joe Sibley', revised on publication in book form following complaints from the artist Whistler. The eight parts extracted from Harper's New Monthly Magazine (Harper & Brothers, New York and London), January to August 1894. pp., 8vo, paginated 167-189 (and magazine frontispiece); 329-350; 567-; 721-741; 825- [the last five from vol.88]; 67-87; 261-284; 351-374 [the last three from vol.89]. In a contemporary binding, with ticket of Goulden & Curry, The Royal Library, Tunbridge Wells. Very good, lightly aged and worn, in black leather half-binding with black cloth boards and gilt tooling. Ownership inscription on front free endpaper: 'Weldon | Didmarton | Janry. 1900 -'. [Original drawings for Punch cartoons; women] Four original ink drawings, later engraved and published Punch, on the subjects: women on bicycles, ice skating, women in the Oxford and Cambridge boat race, punting. The cartoons were published in Punch (London): 26 August 1865; 18 May and 2 June 1866; 18 May 1869. Four charming and amusing cartoons from Punch's golden age. All four are executed in a similar style, but the identity of the cartoonist or cartoonists is unknown. (The first of the two cartoons in Item Two below, as published by Punch, has the monogram signature 'F C' engraved in the bottom right-hand corner. No Punch cartoonist with these initials is apparent.) ONE: Captioned: 'Another Brilliant Idea, Only Brillianter!' 21 x 13.5cm. In good condition, on leaf of browned high-acidity paper torn from a notebook. Two men idle in a punt while two women hold up sheets. [Five pamphlets of laws relating to education from The States of Jersey.] 'Lois sur les Ecoles Elémentaires, etc. ', 'Law on Primary Instruction', and three 'Règlements' ('Teachers' (Superannuation) Act 1925', and two on 'Pupil Teacher Centre'). All printed in Jersey, the first (1899, 'Réimpression 1901') by C.-P. Du Parcq, Imprimeur-Libraire, 23, Halkett Place; the other four by 'J.-T. Bigwood, Imprimeur des États, 13, Broad Street: 1909, 1912, 1913 and 1929. All five items are scarce, with no copies of any of them located on either COPAC or OCLC WorldCat. ONE: 'Ordre de Sa Très Excellente Majeste en Conseil En date du 14 Juillet 1899, confirment certain Acte des Etats En date du 29 Mai 1899, intitule: Loi sur les Ecoles Elementaires, etc. Enregistre le 19 Aout 1899.' pp. (text paginated 565-583), 12mo. No wraps. In fair condition, aged, and with punch hole at head. With shelfmarks (of the Board of Education Reference Library, London). ['Truth', Victorian satirical magazine edited by Horace Voules and owned by Henry Labouchère.] Spoof share prospectus for the flotation of 'The British Empire, Unlimited', with 'Memorandum of Association'. 'Supplement to "Truth" Christmas Number, December 25, 1898.' Printed by Love & Wyman, Ltd., Great Queen Street, London, W.C. 4pp., folio. Originally on a bifolium, but now with the two leaves separated and attached to a white stub from an album. In good condition, on aged and lightly-spotted paper, and trimmed at the head. Laid out in the conventional manner, With the reverse of the final leaf printed in landscape, so that the item can be folded into the customary package. Autograph Note Signed ('P. B. Du Chaillu') from the French-American traveller and anthropologist Paul Belloni du Chaillu, reminding his London publisher John Murray of a dinner engagement. 129 Mount Street [London]. 10 January 1863. 1p., 12mo. Good, on lightly-aged paper, with minor traces of mount adhering to the reverse. The note reads: 'My dear Murray, | I hope you have not forgotten your promise to dine with me this evening, at Willis' Rooms, at 7 o'clock precisely. | Yours very truly | P. B. Du Chaillu'. Murray's published du Chaillu's books from 1861 to 1903. 46pp., 4to. Stitched and unbound. In fair condition, with slight staining, and discoloration and wear to the first leaf and blank final leaf. Drophead title, beneath vignette, reading in full: 'Mémoire contenant Réponse, | Pour le Sieur Étienne-Privat Girard, Seigneur de l'Herm & du Colet, de Deses, Intimé, Appellant de son chef, & Suppliant. | Contre Dame Marie-Anne-Angélique de de [sic] Juges, Veuve en premieres noces du Sr. de Troulhas, & à présent Epouse en secondes noces du Sr. de Valmalette, citoyen de cette Ville, Appellant & Suppliant. | En présence de Me. Autograph Letter Signed ('W P Frith') from the artist William Powell Frith [W. P. Frith] to an unnamed correspondent [Lawrence Alma Tadema? ], regarding a forthcoming lecture by the 'Punch' cartoonist and novelist George du Maurier. On letterhead of Ashenhurst, 7 Sydenham Rise, SE [London]. 13 May 1892. [Printed pamphlet.] Explication des Tableaux, Statues, Bustes, etc. composant les Galerie [sic] du Palais de la Chambre des Pairs de France. A Paris, de l'Imprimerie de P. Didot l'Ainé, Imprimeur de la Chambre des Pairs de France, rue du Pont de Lodi, no 6. 1814. 12mo, 72 pp. Stitched. In remains of original grey wraps, with front wrap present (though worn at extremities), but only a trace of rear wrap remaining. Text clear and complete. 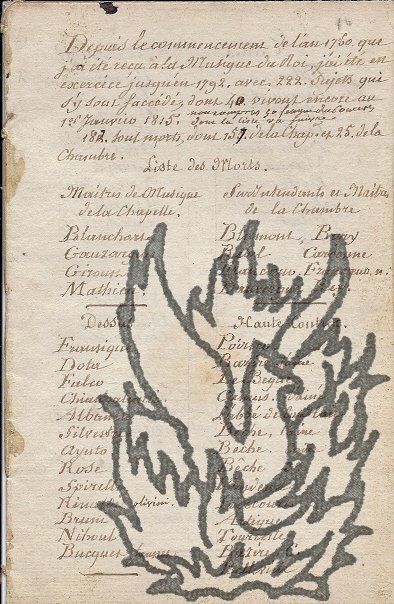 On aged paper with many dog-eared corners. 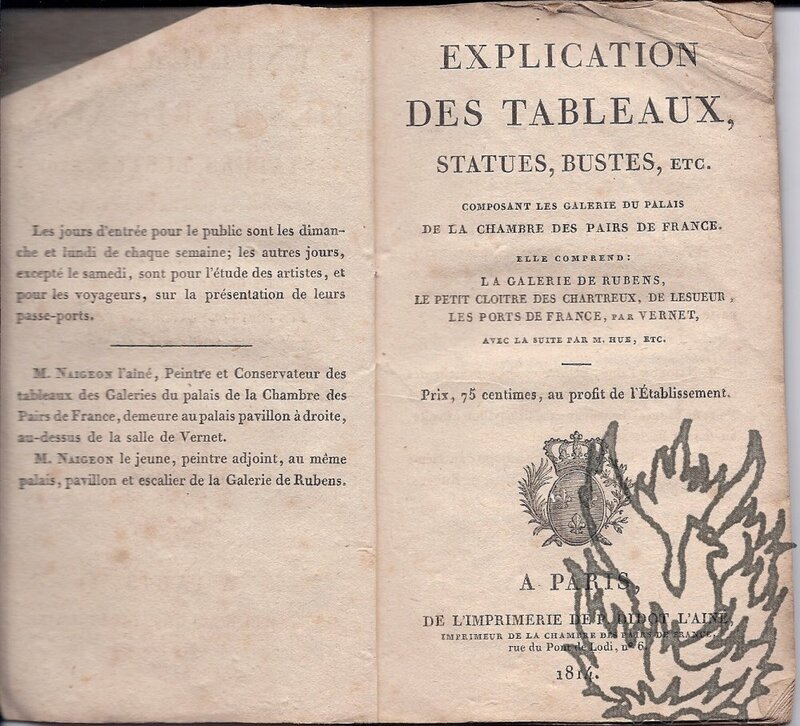 An ephemeral item by one of the greatest of French printers: COPAC only lists three copies, at Oxford, University College London, and the Victoria and Albert Museum. None of these record the misprint in the title of 'les Galerie' for 'les Galeries', and it is not present in the Harvard copy either. Anonymous manuscript, in French, by the 'Doyen de la Musique du Roi', listing those 'Musiciens du Roi' alive and dead in 1815, and giving the 'Apostile de M. de Rohan a ma demande de Bibliotécaire [sic] honoraire'. 12mo, 8 pp. Fair, on aged laid paper. On four leaves removed from a pocket book, with two leaves numbered in manuscript '41' and '42'. Apparently a first-person draft of information for an appeal by the oldest surviving member (from the inception of the group) for a stipend. Begins 'Depuis le commencement de l'an 1760 que j'ai ete recu a la Musique du Roi, j'ai été en exercice jusqu'en 1792, avec 222. sujets qui s'y sous dont 40 vivant encore au 18 Janvier 1815. [...]'. Album containing 112 well-executed pen and ink drawings by the French nineteenth-century artist H. Du Chene de Vere [H. Duchene de Vere]. All undated [1850s?]. Captions may indicate that the drawings were executed in France, Italy and England. 4to album of 33 leaves, with the 112 illustrations each on a separate piece of paper, and all laid down on 59 of the album's 66 leaves (the blank leaves of the album bearing traces of other illustrations having been removed). The illustrations range in size from 19 x 15.5 cm to 6 x 3 cm, with the average around 15 x 11 cm. The album's brown cloth covers are faded and worn, but internally the album is sound, with the illustrations themselves in good condition, on lightly-aged paper. Around twenty are signed, half with the spelling 'Duchene' and the other half 'Du Chene'. Autograph Signature ('P. B. Du Chaillu'). In pencil, on strip of paper roughly 2.5 x 13 cm. Laid down on piece of card. On lightly-aged and creased paper, with small tear close to the right of the signature. Autograph Letter Signed ('C. Genest'), in French, to unnamed male recipient. Undated, on printed 1840s lettehead of the 'Revue du XIXème siècle', 'Bureaux, 11, rue de Lille', Paris. 12mo, 1 p. 20 lines of text. Clear and complete. On aged paper and lightly-creased paper. Writing to ask how the recipient wishes to deal with 'traités de Botanique et de Chimie' in his reviews. Written during the first of several incarnations of the 'Revue', this one beginning around 1836. 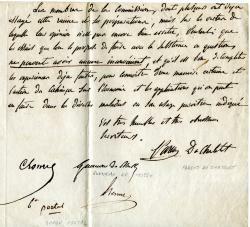 Autograph Letter Signed ('Duval') to 'Monsieur Le Commandant de la Station anglaise Vis-a-vis les côtes du dit départment. '; with copy by Duval (signed by him) of General La Barolière's 'Ordre du jour', at the start of the Peace of Amiens. 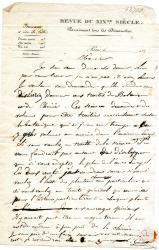 Duval's letter: 'le 19 Vendemiaire au 10e. de la république Française' [10 Oct. 1801]. 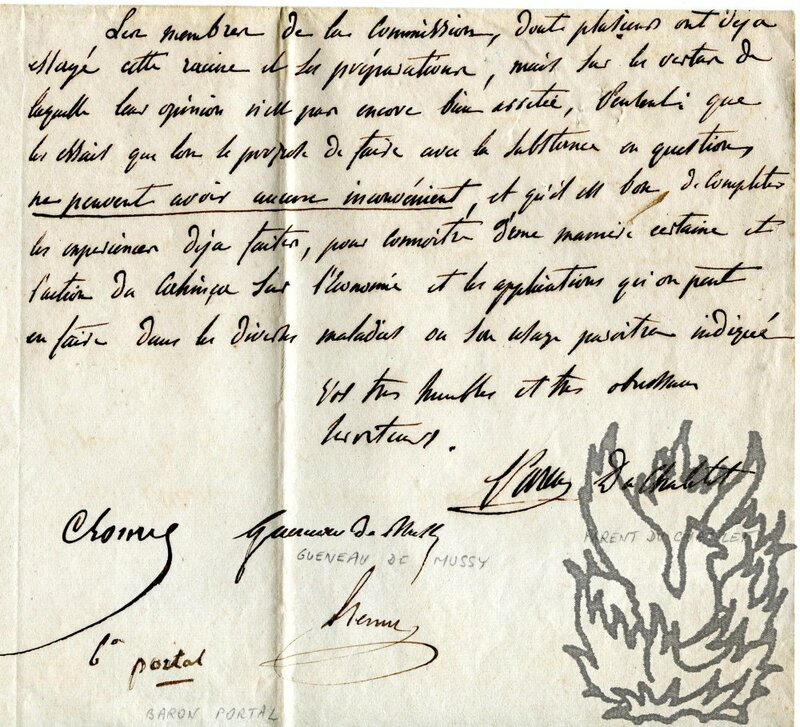 The copy of La Barolière's letter: dated the previous day [9 Oct. 1801]. Both items on letterhead of the Inspection des Côtes Maritimes, Département du Calvados. 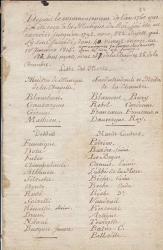 Each item on a piece of laid paper roughly 33 x 21 cm, and each with the same letterhead (with manuscript additions in square brackets] of the 'Armée d[e L'Ouest] | Liberté Égalité | [14e.] Division Militaire | Inspection des Côtes Maritimes. | Département du Calvados.' Both items in very good condition: on lightly aged and creased paper. Both in French. Secretarial Letter Signed ('Le Vte. de La Rochefoucauld'), as 'Aide de Camp du Roi, chargé du Département des Beaux Arts', in French, to the editor in chief of the Parisian newspaper 'Le Pilote'. Paris le 21 Mai 1825', on letterhead of the Ministère de la Maison du Roi. Département des Beaux Arts. Foolscap (roughly 31.5 x 20 cm): 2 pp. Bifolium with blank second leaf. Thirty-one lines of text. On lightly aged and creased paper, with some discoloration and chipping in a thin strip at head (roughly 1.5 cm deep), affecting the date and letterhead but not the text. Text clear and entire. Casting interesting light on early nineteenth-century news management by the authorities in the continental Europe. The letter concerns the coronation of Charles X. Five Autograph Letters Signed (all 'E. Contambert'), in French: three to Ange de Saint-Priest and one to 'Monsieur le Caissier' of 'L'Encyclopédie'. 1852, 1874 and two undated. All items in good condition, on lightly aged paper, with text clear and entire. Letter Two with a little light spotting to the recto of the first leaf. Written in a crabbed hand. Concerning contributions by Cortambert to 'L'Encyclopédie'. Letter One (12mo, 3 pp): To 'Monsieur et honorable directeur', 9 July 1852. Letter Two (12mo, 3 pp): To 'Monsieur et honorable directeur', 7 June 1874. Letter Three (12mo, 1 p): To 'Mr de St Priest', undated. Letter Four (8vo, 1 p): To 'Monsieur le Caissier de Encyclopédie du 19e Siècle', Paris, Rue de Saintonge, 64. Autograph Letter Signed ('h. f.') to 'Madame [Eliza] Thomas'. 1 September 1842 ('4h du matin'); place not stated. 8vo bifolium, 3 pp. 57 lines of text. Addressed on verso of second leaf of bifolium, with circular postmark in black ink, to 'Madame Thomas, chateau de marville, près et par St. Denis (Banlieue de Paris).' Good, on lightly creased and aged paper, with slight damage to second leaf from breaking of wafer. Text clear and entire, in a difficult, indiosyncratic hand. An interesting and significant letter, announcing Fournel's appointment to the post which would result in his greatest achievement. Autograph Letter Signed ('Barbié du Bocage'), in French, to 'Monsieur le Rédacteur de la Quotidienne'. 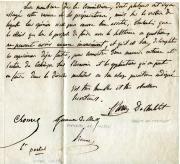 10 September 1825; on letterhead of the Université de France (headed 'Le Doyen de la faculté des Lettres'). 4to, 1 p. Addressed in autograph on the reverse of the second leaf of the bifolium. Good, though lightly creased and a little grubby. He is sending a notice (not present) announcing the courses for the term 1825-1826 at the Faculté, and asks for it to be inserted as soon as possible 'en totalité ou par extrait dans votre journal'. 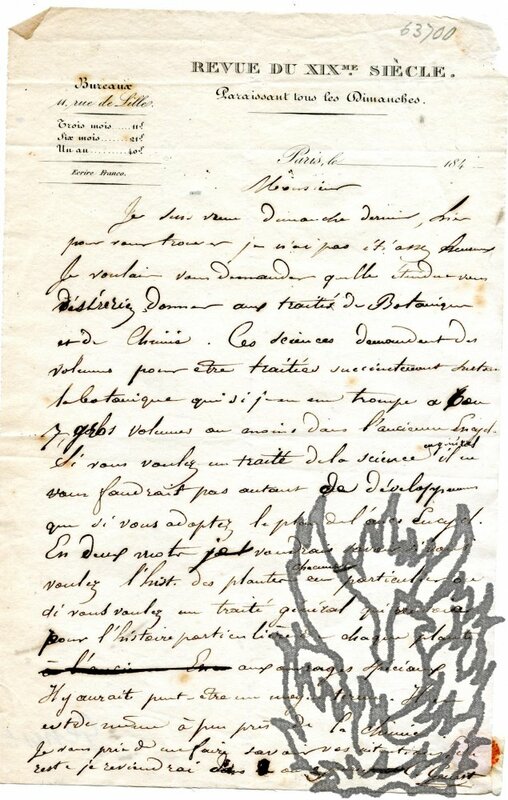 Autograph Letter Signed ('henri Fournel') to the Parisian publisher and bookseller Duprat. 4 August 1861; 'rue de la Chaussée d’Antin 58 bis', Paris. 16mo (13 x 10.5 cm), 1 p, 8 lines of text. Good. Ordering a geographical work and referring (obscurely) to words with an arab flavour (hard to read).